Do you like chocolate? Is that a really silly question? I was lucky enough to be sent some Divine Chocolate to review. It was a generously-sized bar of the dark chocolate with orange and ginger. I loved the taste although it took me a few minutes to get used to the texture presumably orange or ginger strands. I don’t actually eat chocolate often but when I do, I like it to be a really indulgent treat. Divine Chocolate fits the bill perfectly. Chocolate to savour or to share with a very special loved one. A lovely addition to a romantic night at home. Alternatively, something to hide away just for you when the children are in bed and you want to reward yourself for another day of juggling it all. Even better, you can rest assured that the producers of the chocolate are getting rewarded appropriately for their efforts too. 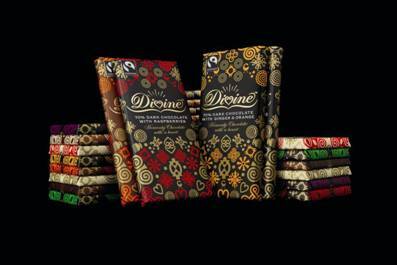 Divine Chocolate products are made from the best Ghanaian cocoa supplied by the Kuapa Kokoo cooperative that owns 45% of the company, and are free from artificial flavourings, colourings and preservatives. They are all suitable for vegetarians, and carry the FAIRTRADE MARK. In celebration of Divine’s Ghanaian ownership, the bars are decorated in gold with distinctive traditional West African motifs called Adinkra symbols, each of which carry their own meaning, making them a beautiful gift as well as a perfect treat. Where Next For Groovy Mums and Me?